This common twiner has stems covered with very small hairs. 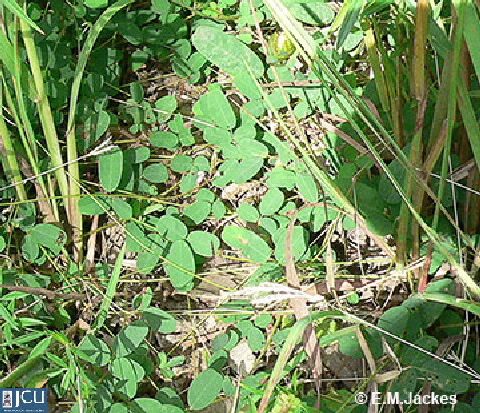 Leaves have 3 leaflets, 6.5 x 3 cm, small hairs present on the lower surface, some may be present on the upper surface, stipels present. Flowers 1-10 in a raceme to 15 cm long, individual flowers often in a cluster of 2-3; standard pink to 8 mm long with an indentation at the apex. Pod to 60 x 7 mm, flattened and covered with hairs; seeds 6-10.